Summer Wars: Complete Edition Review – AiPT! The late ’90s and the ’00s were an in imaginative time for depictions of technology in fiction. Computers and the internet were still relatively new enough in the popular consciousness to seem full of possibilities beyond just doxxing and Nazis on Twitter. As a result, there were a lot of anime (Digimon, Serial Experiments Lain, Summer Wars) that explored just what exactly the internet could be and how people could interact with it. Despite its good reputation I never got around to watching Summer Wars, so when Vertical Comics recently republished the manga version I was eager to check it out. Summer Wars: Complete Edition collects the entirety of the comic written by Mamoru Hosada, drawn by Iqura Sugimoto, and featuring character designs by Yoshiyuki Sadamoto. How does the manga hold up nearly a decade after its original release? Is it good? In terms of its artistic vision of the internet, Summer Wars impresses. The virtual world OZ is very visually pleasing, as it has a well-designed geometric look. Platforms and towers are made up of shapes that are well-served by Sugimoto’s clean lines. OZ balances all these shapes with a plethora of white space, which helps keep the world looking streamlined instead of overly busy. There’s still a sense of wonder to the cyberspace though, which is pivotal in making the manga’s events feel significant. The characters’ various avatars and programs within OZ also tend to look quite cool. Their designs tend to reflect their creator characters quite well, furthering the sense that OZ (and the internet in general) is shaped by human standards of communication. On the downside, we don’t get a whole lot of detail regarding how OZ works or how it and its adjacent programs came to be. There is at least some brief mention of who created the main antagonist, an artificial intelligence known as Love Machine, but this is delved into so little that it could be omitted without impacting the manga in any significant way. Thankfully, even though the “how” behind the cyber-warfare doesn’t get much development, the “what” remains quite interesting. There’s a suspenseful section involving a hacked nuclear missile, plus an unexpected gambling match between a real person’s avatar and Love Machine. These events convey the drastic consequences of technology gone wrong in ways that don’t feel done to death, and that show off the creators’ creativity. It’s worth noting that the relative lack of development of OZ can be attributed to Summer Wars focusing more on the main characters’ family dynamics and real-world concerns. This isn’t the story of a unique sci-fi threat to mankind so much as its the story of a high school student’s eventful family reunion, which happens to coincide with such a threat. There would be nothing wrong with this premise if it was effectively executed, but unfortunately the protagonists themselves are much less interesting than the concepts around them. On the plus side, their dialogue is well-written and their dynamics within the family are fleshed out. Nonetheless, the characters aren’t ultimately memorable enough to counteract the disappointment caused by their personal dramas taking up page-time that could have been used developing the technological themes. This lack of satisfaction is also due to the rapid pace at which the family drama unfolds. The manga’s end crams in a lot of sentimentality, and while it doesn’t entirely fall flat it’s still weakened by not having enough build-up. 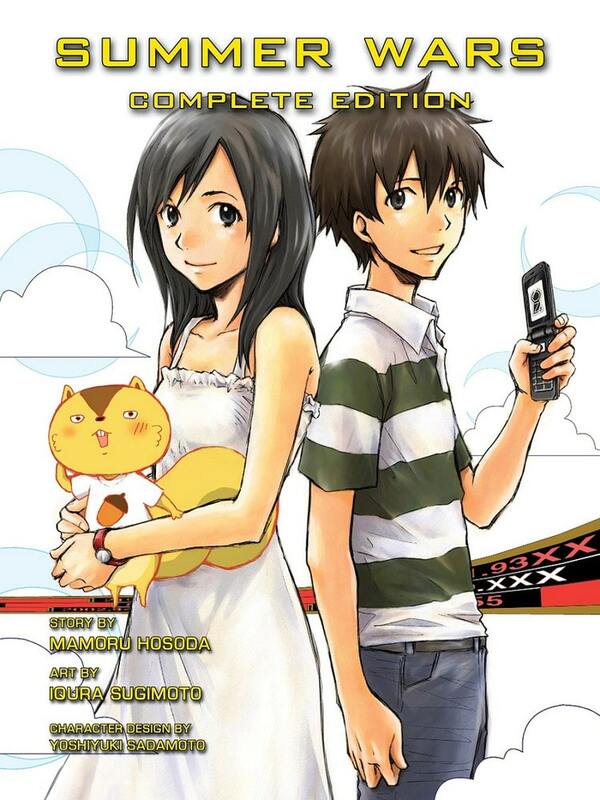 All in all, Summer Wars: Complete Edition is a nice re-release of the manga. Sugimoto’s art is solid all around, but it’s especially impressive in the scenes that take place in OZ. The story is also at its most interesting when the characters are in OZ or otherwise dealing with technological warfare. While the real world portions of the narrative aren’t outright bad, they’re hindered by some pacing issues and sentimentality that doesn’t feel fully earned. With that said, Summer Wars holds up quite well as a whole. Though the human elements of this manga could have been paced more effecitvely, the artwork and world of OZ still impress a decade later.